Well here's one I did just for fun..... thought it would make a change from summer beach photos! The lace is from a petticoat mum was outing when she was here - we split the edging half each and so you an see Patty, what to do with it now! That's nice and fresh Maria. Who took the photo ? that the lace came from Patty's petticoat. 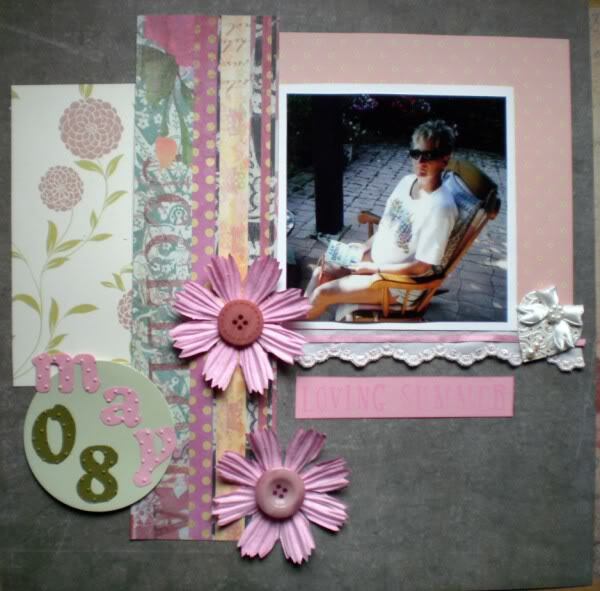 Pretty heart embellishment, lovely layout. actually the heart embellishment was one Billie sent me last year with some lace - there were six of them on the card and Ive only used two! Twiz took the photo. Those were the days eh, warm and bright, just a memory. A nice reminder that this cold and dark will pass, thanks Maria. Liking the recycling v much, very pretty.